Guests may visit the monastery for Personal Retreats throughout most of the year, except during scheduled closures, scheduled retreats and winter retreat. Personal Retreats are overnight stays of varying duration for self-guided meditators who wish to partake in the monastery’s daily schedule of activities. 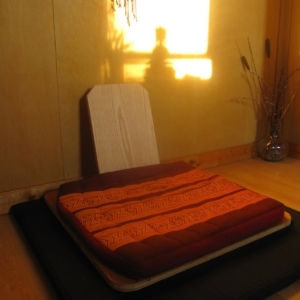 In contrast to formal retreats, there is no formal meditation instruction given during Personal Retreats and the schedule is more open for individual practitioners to determine a practice schedule that best suits themselves and the community’s needs. Guests have occasional opportunities to join Ajahn Sona for teatime Dhamma talks and/or one-on-one interviews. All Personal Retreatants are asked to arrive only on Wednesdays, Fridays or Sundays. Departures may occur on any day of the week. Two-night minimum. If you have no retreat experience and this is your first visit to a monastery, you may apply to stay for a maximum of five days (possibly a bit longer if visiting from out-of-province or internationally). If you have not visited Birken in the recent past, you may apply to stay up to 10 days (or one week if you need Wednesday pick-ups and drop-offs in Kamloops). If you are a frequent visitor and have stayed for at least 10 days in the past, you may apply to stay up to two weeks. Longer stays require special permission from the Abbot. 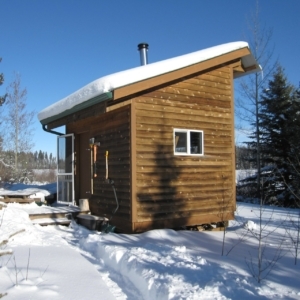 All guests are limited to 30 days of total retreat time at Birken, per calendar year. Please consult the Birken Calendar to determine a suitable period of time for your Personal Retreat. First-time visitors should not plan to come for a visit when Ajahn Sona is away. We no longer maintain a ‘vacancies calendar’ – you may submit a registration form for your desired dates and we will notify you if space is no longer available. Prior to registering for a Personal Retreat, please make sure you have read the latest version of our Guest Guidelines outlining our daily schedule, monastery etiquette, and other guidelines applicable to your stay. All guests are expected to abide by the Eight Precepts outlined in our Guest Guide. It is customary for all guests to help out with light chores around the monastery throughout their stay. Please sign up for one or more tasks on the ‘Yogi Duties’ board in the kitchen upon arrival. All guests are asked to assist with breakfast and lunch clean-up. Please plan to arrive at Birken sometime between 1:00–4:00pm if you are driving to the monastery (or by 1:30pm if requesting a pick-up in Kamloops). PLEASE NOTE: we now require all guests arriving and departing from the Kamloops Airport to take a taxi / shuttle to and from the Birken pick up location (detailed instructions will be provided in your retreat confirmation). There will be only one guest pick-up and drop-off location in Kamloops. Participants needing a ride to Kamloops will depart the monastery after breakfast (about 8:30am). Prior to registration, you must determine how you plan to arrive and depart, and include this information on your registration form (please wait to finalize your transportation arrangements until the Birken Office has confirmed your booking). Please visit Getting Here for more details. Last-minute cancellations are burdensome to the monastery and prevent other guests from the precious opportunity to visit. Please notify us as soon as possible if you need to cancel your visit. Those who cancel at the last minute or leave the monastery prior to their scheduled departure date, may be subject to restrictions on future visits. Name, phone number, and/or e-mail address of emergency contact. This should be someone that you are NOT travelling with. Before submitting your request, please consult the Birken Calendar to ensure your Personal Retreat does not conflict with a scheduled retreat at the monastery. Thank you. *All arrivals must be on Wednesdays, Fridays or Sundays. Please include your flight #/s and arrival times, and if you are travelling with other guests to the monastery. Please include the bus company and arrival time, and if you are travelling with other guests to the monastery. Pick-ups in Kamloops can be arranged for early afternoon on Wednesdays OR on the start and end dates of scheduled retreats. Please note: we no longer pick up or drop off guests at the Kamloops Airport. If you travel by air, you will need to take a taxi to our pick-up location (please allow 30 mins travel time; exact location details will be sent to you in our confirmation email). Pick-ups in Kamloops can be arranged for early afternoon on Wednesdays OR on the start and end dates of scheduled retreats. There is one pickup location in Kamloops, exact location details will be sent to you in our confirmation email. Please include your flight #/s and departure times, and if you are travelling with other guests from the monastery. Please include the bus company and departure time, and if you are travelling with other guests from the monastery. Drop-offs in Kamloops can be arranged for mornings on Wednesdays OR on the start and end dates of scheduled retreats. Please note: we no longer pick up or drop off guests at the Kamloops Airport. If you travel by air, you will need to take a taxi from our drop-off location to the airport (please allow 30 mins travel time; exact location details will be sent to you in our confirmation email). Drop-offs in Kamloops can be arranged for mornings on Wednesdays OR on the start and end dates of scheduled retreats. There is one pickup location in Kamloops, exact location details will be sent to you in our confirmation email. Please note that kutis are rarely available. Most guests will be assigned to the main house. Particular room requests inside the main guest house are not permitted. We ask all guests to accept whatever accommodation is provided with a sense of contentment and gratitude. Occasionally, guests have the opportunity to participate in teatime Dhamma talks with the Abbot and other members of the community at 5:00pm. You are welcome to arrive earlier in the day and join us for lunch at 11:00am (11:30am during Daylight Saving Time), and explore the monastery building and grounds on your own. But please keep to the main road and do not wander down the small paths to the cabins (‘kutis’), which are private for monastics and residents. Within the main building, the meditation sala on the ground floor is available for sitting meditation at any time of the day. You are also welcome to peruse our library or use the walking meditation hall, both located in the basement. Day Visitors may also participate in our daily evening group meditation from 7:00 – 7:50pm. Don’t worry if you’ve never done it before – a kitchen steward will be on site to assist you as needed. For more information, please see Food & Material Offerings. We will then notify you if your planned visit conflicts with any scheduled closures or events here at the monastery. Please note that your Day Visit and/or Dana Meal is not confirmed until you receive approval from the Birken Office. If you plan to arrive in the morning for a Day Visit, please make sure to let us know so we can advise the kitchen that you’ll be here for the midday meal at 11am (11:30am during Daylight Saving Time). If it is your first time visiting the monastery, we recommend that you read through our Guest Guidelines to get a sense of proper monastery etiquette and our daily schedule. For information on how to get to Birken, please see Getting Here. At certain times of the year, Ajahn Sona leads Scheduled Retreats at the monastery for both Absolute Beginners and Experienced Meditators. These are formal, guided retreats where participants arrive and depart on the same day and take part in a structured group schedule of mental cultivation. See below for the scheduled retreats for this year, and also note the opening and closing dates for registration specific to each retreat. 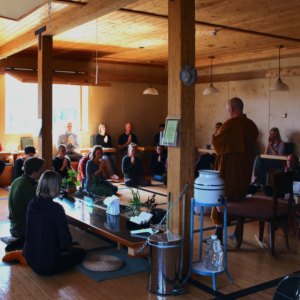 To book a Scheduled Retreat at Birken, please read Retreat Info and detailed booking guidelines below and then submit the online registration form. This is a retreat for Absolute Beginners – people who have never meditated, visited a monastery, or been on a meditation retreat. You don’t need to know anything about Buddhism or meditation. The retreat provides a gentle introduction to the art of mental cultivation, with lots of instruction and guidance, short meditation periods (10 to 20 minutes), lots of free time, and opportunities to talk. We start with the absolute basics: how to sit for meditation, experimenting with various postures and aids (cushion, kneeling stool, chair). Key aspects of the Buddha’s teachings are presented, highlighting the benefits and importance of meditation to one’s own well-being and liberation. There is an option for a light evening snack (contrary to the normal practice at the monastery, where only two meals are eaten: breakfast at 7:00am and the main meal at 11:30am). The retreat starts at 5:00pm on Friday, July 19, with a teatime orientation from the Abbot, Ajahn Sona, and a chance to ask questions. Prior to registering for a Scheduled Retreat, please make sure you have read the latest version of our Guest Guidelines outlining our daily schedule, monastery etiquette, and other guidelines applicable to your stay. All guests are expected to abide by the Eight Precepts outlined in our Guest Guide. Please plan to arrive at Birken sometime between 1:00–4:00pm if you are driving to the monastery (or by 1:30pm if requesting a pick-up in Kamloops). PLEASE NOTE: we now require all guests arriving and departing from the Kamloops Airport to take a taxi / shuttle to and from the Birken pick up location (detailed instructions will be provided in your retreat confirmation). There will be only one guest pick-up and drop-off location in Kamloops. Participants needing a ride to Kamloops will depart the monastery after breakfast (about 8:30am). Prior to registration, you must determine how you plan to arrive and depart and include this information on your registration form (please wait to finalize your transportation arrangements until the Birken Office has confirmed your booking). Please visit Getting Here for more details. Last-minute cancellations are burdensome to the monastery and prevent other guests from the precious opportunity to visit. Please notify us as soon as possible if you need to cancel your visit. Those who cancel at the last minute or leave the monastery prior to their scheduled departure date, will be subject to restrictions on future visits. Registration for the Absolute Beginners Retreat opens April 15, 2019 and closes May 31, 2019. Accepted candidates will be notified by email in early June. All others will be notified that they have been placed on a waitlist. Interested candidates who are unable to attend the retreat this year are invited to come another time for a Personal Retreat. If you have not heard back from the Birken Office by mid-June, please email us at bookings@birken.ca to make sure that we received your form. This is a retreat for ‘Experienced Meditators’ – lay people who have had a regular meditation practice for some years and have previously attended a 10-day residential retreat. Priority will be given to those who have visited Birken for a Personal Retreat or Scheduled Retreat of at least 10 days in the recent past. The retreat includes some instruction, as well as extended meditation periods (2 to 3 hours), allowing meditators to alternate sitting and walking meditation at their discretion. The retreat is conducted in silence: there is no conversation between participants during the duration of the retreat. Reading and listening to audio talks are also strongly discouraged. There will be opportunities to join Ajahn Sona for Dhamma talks throughout the retreat. The retreat starts at 5:00pm on Friday, September 27, with a teatime orientation led by the Abbot, Ajahn Sona, and a chance to ask questions. Prerequisite: Prior 10-day retreat experience. Priority is given to those who have visited Birken for a Personal Retreat or Scheduled Retreat of at least 10 days in the recent past. It is customary for all guests to help out with light chores around the monastery throughout their stay. ‘Yogi Duties’ will be assigned for this retreat; please see the ‘Yogi Duties’ board in the kitchen upon arrival. All guests are asked to assist with breakfast and lunch clean-up. Registration for the 10-Day Silent Retreat opens April 15, 2019 and closes June 30, 2019. Note: For arrivals before 9/27, please fill out a personal retreat form. Note: For departures after 10/6, please fill out a personal retreat form. Ajahn Sona will review all 10-Day Silent Retreat applications and select those who can best benefit from this period of quiet practice. Accepted candidates will be notified by email in July and asked to reconfirm their commitment to attend the retreat. All others will be notified that they have been placed on a waitlist. Interested candidates who are unable to attend the retreat this year are invited to come another time for a Personal Retreat and can check back next year for more scheduled retreat opportunities. If you have not heard back from the Birken Office by late-July, please email us at bookings@birken.ca to make sure that we received your form. This is a retreat specifically focussed on the theme of Metta (Loving-Kindness) for ‘Experienced Meditators’ – lay people who have had a regular meditation practice for some years and have previously attended a 10-day residential retreat. Priority will be given to those who have visited Birken for a Personal Retreat or Scheduled Retreat of at least 10 days in the recent past. The retreat includes some instruction, as well as extended meditation periods (2 to 3 hours), allowing meditators to alternate sitting and walking meditation at their discretion. The retreat is conducted in silence: there is no conversation between participants during the duration of the retreat. Reading and listening to audio talks are also strongly discouraged. There will be opportunities to join Ajahn Sona for Dhamma talks throughout the retreat. The retreat starts at 5:00pm on Sunday, December 22, with a teatime orientation led by the Abbot, Ajahn Sona, and a chance to ask questions. Please plan to arrive at Birken sometime between 1:00–4:00pm if you are driving to the monastery (or by 1:30pm if requesting a pick-up in Kamloops). PLEASE NOTE: we now require all guests arriving and departing from the Kamloops Airport to take a taxi/shuttle to and from the Birken pick up location (detailed instructions will be provided in your retreat confirmation). There will be only one guest pick-up and drop-off location in Kamloops. Participants needing a ride to Kamloops will depart the monastery after breakfast (about 8:30am). Prior to registration, you must determine how you plan to arrive and depart and include this information on your registration form (please wait to finalize your transportation arrangements until the Birken Office has confirmed your booking). Please visit Getting Here for more details. 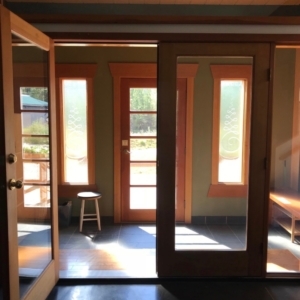 Registration for the 10-Day Metta Retreat opens June 1, 2019 and closes August 31, 2019. The online registration form will be posted here on June 1st. Please check back at that time. Ajahn Sona will review all 10-Day Metta Retreat applications and select those who can best benefit from this period of quiet practice. Accepted candidates will be notified by email in September and asked to reconfirm their commitment to attend the retreat. All others will be notified that they have been placed on a waitlist. Interested candidates who are unable to attend the retreat this year are invited to come another time for a Personal Retreat and can check back next year for more scheduled retreat opportunities. If you have not heard back from the Birken Office by late-October, please email us at bookings@birken.ca to make sure that we received your form. January to April is the annual period of monastic-centred retreat for the resident community of Birken. During this time, Birken will accept a limited number of bookings from experienced lay meditators who have visited Birken for extended stays in the recent past and who are willing to lend a helping hand towards the daily running of the monastery. All guests will be assigned light chores for the duration of their stay. Priority will be given to those who have attended previous Winter Retreats at Birken or who have been visiting Birken regularly over the last two years. The dates for our 2020 Winter Retreat and details about our Jhana Retreat will be posted here later this year.